When you are interested in Clinical Hypnotherapy Training … Communicating Excellence run two courses for you to attain your Clinical Hypnotherapy Diploma. The shorter course requires you already have an NLP Practitioner certificate. Courses are held in Newcastle upon Tyne and North East England. Training approved with The General Hypnotherapy Register and Society of NLP. The longer course begins in January 2011. 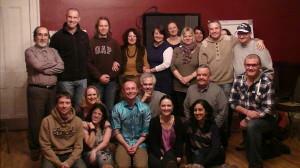 This is NLP Practitioner Training @ £495 in Newcastle upon Tyne North East England. click here for full course information and downloadable prospectus. The longer course is equivalent to doing an NLP Practitioner plus the short course. Whichever route you choose our Hypnotherapy Diploma course is both recognised and validated by the General Hypnotherapy Standards Council and The Society Of NLP. What will you get by choosing this course? Qualification recognised, approved and validated by the GHSC, GHR and SNLP. On successful completion of this course you will have all the skills to effectively and ethically assist your clients to make the changes the require. It also means you WILL NOT be reading scripts to them because you will be really conversant in solution focused hypnotic language patterns and acting fully in the role of a Professional Hypnotherapist so this way your attention will be focused in the correct place – your client. That’s not the case at all with Communicating Excellence’s course. The trainers are SO down to earth, yet SO sophisticated and SO funny, you’ll find yourself learning, laughing and experimenting your way to a new level of skill and qualification. The training has an overt NLP focus, so ideal for you if you have some understanding of this field. In fact, even as a Trainer of NLP, my NLP repertoire was significantly expanded and enriched, while learning a complete set of hypnotherapy skills. Double bonus.